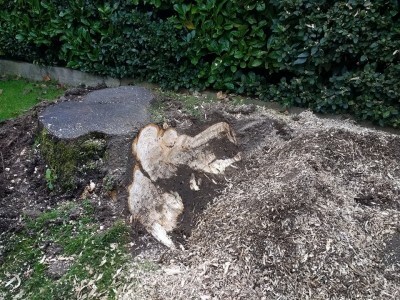 Before we go ahead and grind out any tree stump our experts will discuss what it is you want to use the cleared site for afterwards. This will help us to decide how far below the surface we will need to grind. Rest assured our specialists will guide you through the process. Because our tree stump grinding machinery comes in a variety of sizes, we are well equipped to take on any challenge. Our equipment is extremely powerful on a narrow access platform and is therefore able to tackle large and small projects. We are respectful of your property and take extreme care when working on site. 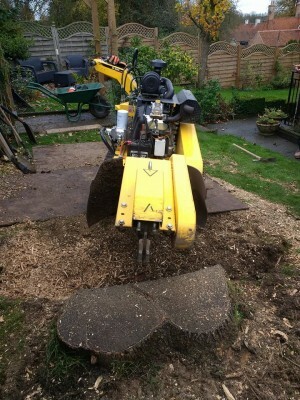 Once the machinery is in place our tree stump specialists will grind down several inches below ground level, removing the stump. This action produces mulch, which is packed with nutrients and is most beneficial when used on your soil. The remaining hole can be filled, covered with the tree mulch or you can cover it with topsoil, ready for new grass/turf or replanting.